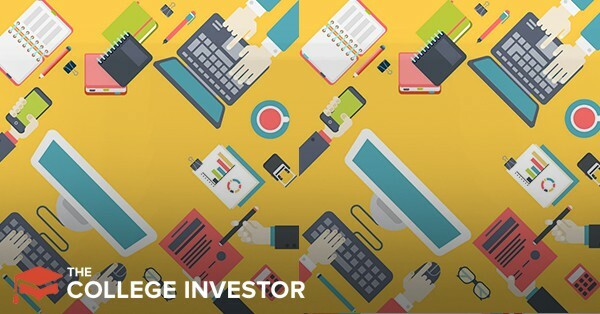 Peerform is a marketplace that matches borrowers with investors. If you’re looking to borrow money, the platform will place your loan in their lending marketplace. If investors find the loan enticing enough, they’ll fund it and the borrower will receive the funds. In this article, we’ll review how Peerform works. Peerform was founded in 2010 and acquired by Versara Lending on November 7, 2016. Peerform matches borrowers and lenders through their lending marketplace platform. By watching their competitors (mainly traditional banks) and the fact that few loan applications are ever approved, the company turned its mission into one that ensures money gets into the hands of those who need it without all of the associated fees. The above specifications aren’t restrictive and are fairly standard in the lending industry. Peerform loans are unsecured. This means they are very similar to a credit card in which collateral is not required. An unsecured personal loan in the amount of $5,000.00 at a term of 36 months with a fixed annual percentage rate of 23.77% would result in 36 monthly payments of $185.79. Rates are accurate as of June 15, 2017, and are subject to change without notice. Peerform offers a compelling investment opportunity. Loans on the company’s marketplace are funded by accredited investors. Once a borrower applies for a loan, the information about that loan is listed with others on the marketplace. Information displayed includes the interest rate, grade, amount, purpose, and days left to complete funding. For investors, loans with high grades (designating high quality) offer the least risk but also lower returns. For example, a loan with a AAA grade will have an APR of 5.99%. 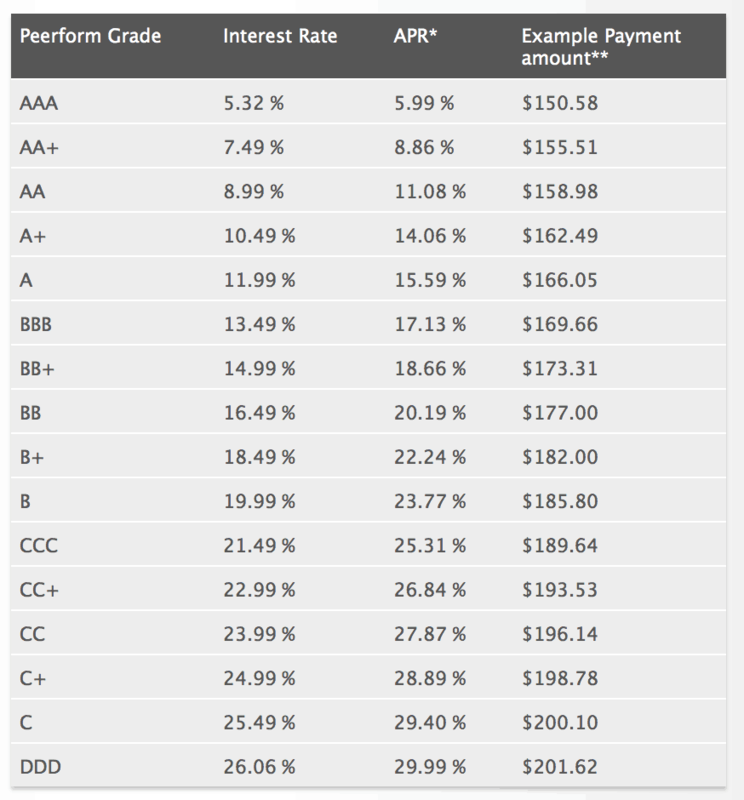 A loan of lower quality with a grade of DDD will have an APR of 29.99%. A high APR is attractive but only those investors with a high risk tolerance will be interested in those types of loans. Peerform also offers loan consolidation. These are by invitation only. Loan consolidations are targeted at those with balances on multiple credit cards. The benefit of a loan consolidation is that your average credit card rate across all consolidated balances is lower than your highest credit card. According to Peerform, you’ll save money in interest through a consolidation. You’ll also have only one payment to make to one lender rather than many payments scattered across multiple lenders with different due dates. With so many lenders, there’s a chance you’ll eventually miss a payment. That won’t happen with a loan consolidation. There aren’t any prepayment fees either. After receiving an invitation for loan consolidation, fill out the application. If approved, you’ll be able to choose from available loan terms. Then your loan is listed on the marketplace just like the loans previously mentioned. In addition to identity and income verifications, Peerform also puts a high priority on security. They use bank-level security protocols, use SSL, and encrypt sensitive information. With its focus on verification and security, Peerform reduces the chance of its users being scammed. For those who are looking for an unsecured loan, the loan application process is straightforward and can be done online within only a few minutes. Loan consolidations are also a nice feature for those who want to consolidate multiple payments into one and avoid potential late fees.